Summary: Alice In Wonderland is all fun and good until she shows up as the girl next door. 12-year-old Alistair is tasked by his neighbor, Fiona, of writing the story of the magical world Aquavania- the children who live there, and the man who is stealing their souls one by one. Why you will love this, short version: With one foot in a realistic setting and one in a magical land, this is a great entry into fantasy for kids (and grown ups) who think they don't like the genre. 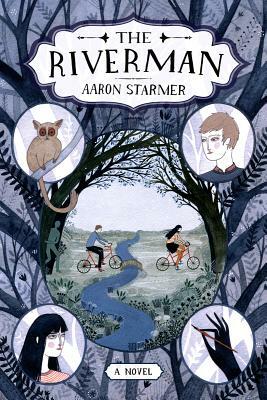 Why you will love this, long version: Aaron Starmer does an amazing job of setting stakes for his characters, both in the real world and in Aquavania. The last book that was this much of a gut-check for me was Tom McNeal's Far, Far Away; you know that feeling, where you want to pin a fictional character to the ground to keep them from heading down a path that you're certain, for some untenable reason, will be bad for them. It's a challenge for me to get through a fantasy novel (I'm trying, guys! ); I not only burned through this one, but wanted to start reading again immediately as soon as I was finished. Alistair Cleary is the kid who everyone trusts. Fiona Loomis is not the typical girl next door. Alistair hasn't really thought of her since they were little kids until she shows up at his doorstep with a proposition: she wants him to write her biography. What begins as an odd vanity project gradually turns into a frightening glimpse into the mind of a potentially troubled girl. Fiona says that in her basement, there's a portal that leads to a magical world where a creature called the Riverman is stealing the souls of children. And Fiona's soul could be next. If Fiona really believes what she's saying, Alistair fears she may be crazy. But if it's true, her life could be at risk. In this novel from Aaron Starmer, it's up to Alistair to separate fact from fiction, fantasy from reality. Aaron Starmer was born in northern California, raised in the suburbs of Syracuse, New York, and educated at Drew University in Madison, New Jersey. His novels for young readers include The Storyteller, The Whisper, and The Riverman. He lives with his family in Stowe, Vermont.